Are you working to ditch processed foods and put more real food on the table? This month we’re running a series called Real Food Made Simple: A Beginner’s Guide to Eating Better. Our goal is to answer the questions you might have and make the transition a whole lot easier! Starting out on a real food journey can be very overwhelming–especially when all of your old favorite recipes call for less than ideal ingredients, and you just don’t know what to cook anymore. Well, I have some good news for you! Most recipes can easily be adapted to include real, whole food ingredients to not only be healthier, but also taste better! Over the past few years, I have worked to cut bad, processed ingredients and foods from my family’s diet. During this time, it has become second nature to me to read a recipe and substitute the bad ingredients for healthier ones. 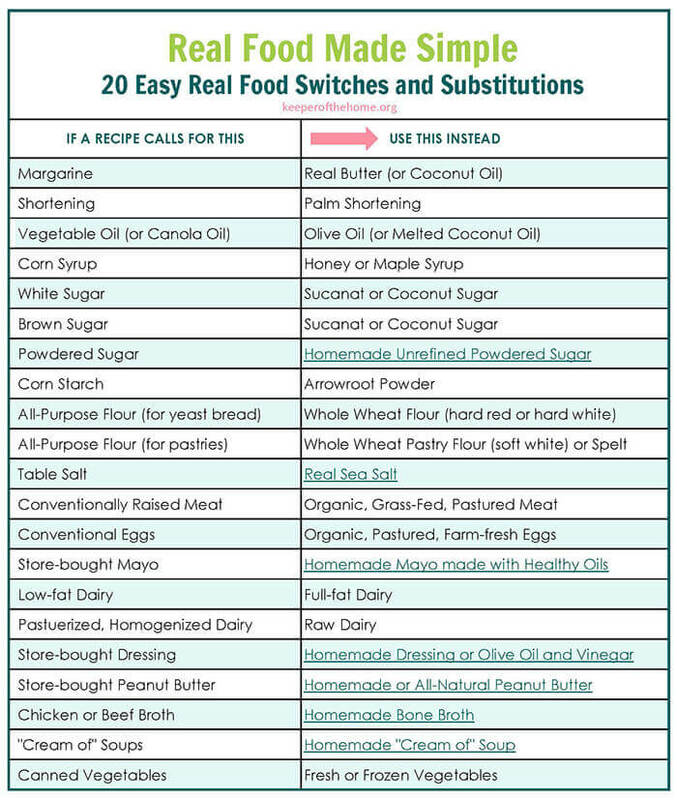 Today, I’m going to share a handy (printable) list with you of 20 different real food ingredient switches and substitutions. This is by no means an exhaustive list, but it is a starting point that should help you in turning almost any recipe into a “real food” recipe. I also want to note that this substitution list could look different for different families. If your family is gluten free, for example, then you would obviously not use whole wheat flour to substitute for all-purpose flour. 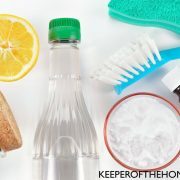 This list is just a general substitution list that you can adjust to meet your family’s needs. Click on the chart to access the free printable PDF, which includes links to the homemade ingredients. Substitute like ingredients for like ingredients. For example, you will have more success substituting regular white sugar with an unrefined granulated sugar (such as sucanat) rather than with a liquid sweetener (such as honey). 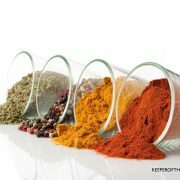 Think about the overall taste of the dish you are preparing when choosing certain substitution ingredients. If you are making an Italian dish that calls for canola oil, then olive oil would be a better substitution choice than coconut oil. The rich flavor of the olive oil will complement the rest of the ingredients better than the tropical flavor of the coconut oil. Don’t be afraid to experiment! Sometimes a recipe may not turn out exactly as expected when you try substituting real food ingredients, but more than likely it will still be yummy! The best way to learn how to switch up recipes to include healthy ingredients is just by doing it. Experience is the best teacher! To help inspire you, and show you how easy it is, I have made up a chart showing how I switched out real food ingredients for less than ideal ones in this apple crisp recipe. 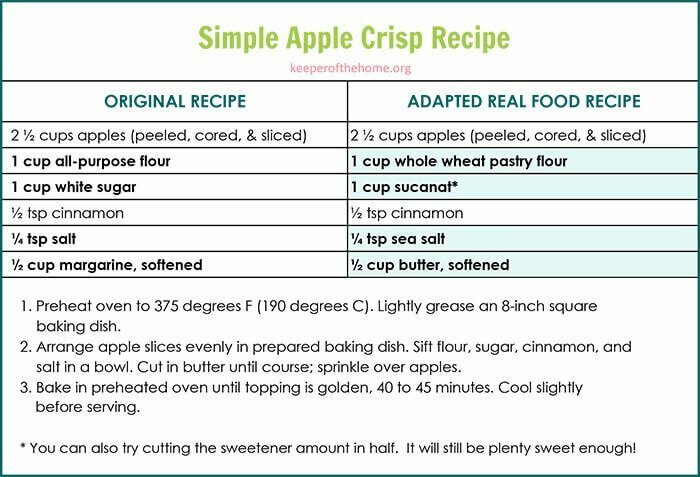 Click on the recipe chart to access the free printable Apple Crisp recipe. Cutting Your Kitchen Prep Time in Half — Or More! The Grain Controversy: Should We Eat Them or Not? 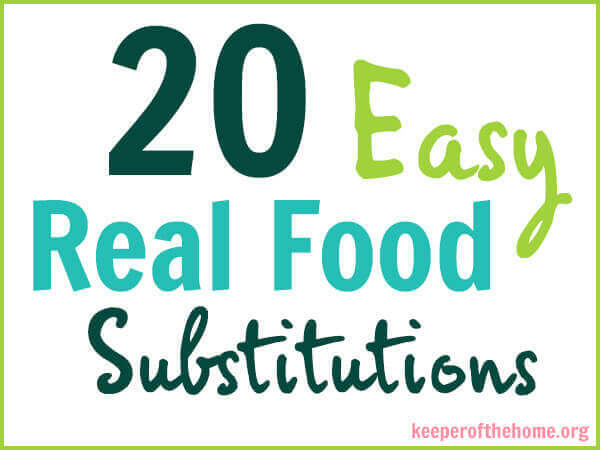 Do you have any substitutions to add to this list? Do you enjoy taking recipes and turning them into “real food” recipes? Previous Post: « 48 Hour Redmond Trading Giveaway! Great post, Mindy! And that printable is rockin’! The pdf above is printable if I click on it. Is there a way to click on the links – Homemade Unrefined Powdered Sugar, for example – to find out how to make those? I often have great success substituting butter for canola oil. If a recipe calls for 1/2 c. canola oil, I will just melt a stick of butter. Not sure that it is technically accurate, but it usually works for me! Thank you so much for doing this series. I am a new wife and mother and did not grow up with natural foods. I’m grateful to my mom for cooking, but I want to provide a variety of recipes that include healthier, organic ingredients. This is helpful, encouraging, and inspiring. Starred, Pinned and Printed!!! Easy to follow and awesome for those of us trying desperately to switch to clean eating! Thanks for this great printable! 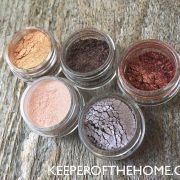 My wife and I have been ‘eating up’ every post on Keeper of the Home lately. I have learned so much about real food. Combined with some other changes we have made we are noticing big changes in the way we feel, energy levels and the behavior of our girls. This printable is going right onto my handy reference board I have stashed inside one of our kitchen cupboard doors. Wow! These resources will be very helpful as my family starts our real food journey. Thanks! 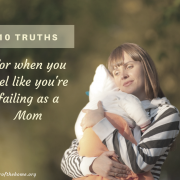 Great post and thank you for the PRINTABLE!!!! I do substituting a lot too. Just wondering, anyone has a substitute for Bacon? Something not us fatty, full of unhealthy stuff and not from a PIG? But crispy and tasty? Thank you! Worth to try. Have u tried turkey bacon? we love it just as much as bacon. Just do not go into thinking it will taste like pig bacon. I have never heard of turkey bacon, sounds interesting. Where do you get it from? We have bought it from Costco. I warn you though that we are off it because 1)It think we bought too much, so got tired and 2) There is A LOT of salt added to this processed meat to make it taste like regular bacon. Also it is more like processed meat rather than regular bacon cuts. 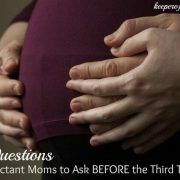 I thought this was a really helpful post! The only one I’m not in the habit of using is pastry flour…Does that basically mean if the recipe does not call for yeast, you use the pastry instead of regular whole wheat? I have never used Sucanat and I was wondering if it tastes like molasses, since it retains it’s molasses content? I love coconut oil! We use it for everything. I also have been using quinoa instead of couscous or rice (it cooks quickly and is packed with protein). They sell it at Costco! We’ve also been using almond milk. It’s amazing in coffee. Thanks for this post! Does anyone know or has researched anything about baking soda/powder? Is it “natural”? Would it/they be considered a real food? I love to bake and eat real food and I’ve been wondering about this for a while and never read anything about it. 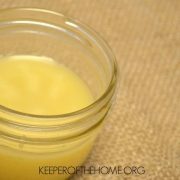 It looks like there should be a link to the homemade bone broth recipe. I’m not sure the link is working? I can’t get to it, at least. Could you please post your recipe? Thank you!!! I have a healthy Rice Crispie squares substitute recipe….the regular one is 6 cups rice crispies, 1/4 cup MRG, 1/2 CUP Peanut Butter, 250 grams marshmellows, 1 tsp vanilla, That is the off-the-back-of-the-box recipe. I exchanged the marg for coconut oil, the Peanut Butter for sunflower seed butter. It is delicoius!! And no plastic (margerine) in it! we often sub expeller pressed coconut oil in the solid state for shortening. it is really good in homemade tortillas. great chart! I have been making drastic changes and switches for the past two years. The funny thing was last night when I was making bread in the bread maker for the first time in a while. I had to substitute everything in the recipe. No sugar in the house so I used honey. On and on… it turned out wonderful. Mindy – I really appreciate your printable list. Thanks for sharing! Is there a related post explaining the reason behind each of the substitutions? I am slowly switching my family to a “real food” diet, and I think it is very important to understand the “why” behind each of the changes we are making.